Business View Magazine profiles Hy-Brid Lifts by Custom Equipment, Inc., Manufacturer of lightweight scissor lifts in Richfield, Wisconsin. It’s axiomatic that what goes up must come down. But when going up and coming down is an essential part of one’s work, as well as a quantifiable part of a company’s bottom line, going up and down both safely and efficiently must also be part of the equation. Custom Equipment, Inc. is a Wisconsin-based manufacturer of Hy-Brid Lifts – the aerial work platforms that help workers go up and down in the safest and most efficient way possible depending on their individual job requirements. Aerial work platforms (AWPs) are used to provide temporary, elevated access for people or equipment. There are two main types of AWP. Large articulated lifts, sometimes known as “cherry pickers,” owing to their origin in fruit orchards, are widely used for maintenance and construction of all types, and are especially useful in the power and telecommunications industries to service overhead lines, and in arboriculture to provide an independent work platform on difficult or dangerous trees. The majority of articulated lifts generally require a wide supportive base to operate safely. The other type of AWP is the scissor lift, which is a platform that can only move vertically, but is generally much smaller and nimbler than its larger, articulated cousin. Scissor lifts are ideal for applications where ample working space and lifting capacity is needed and maneuverability is essential. They have been used to position material, tools, equipment, and personnel for over 50 years, and are both safe and efficient. 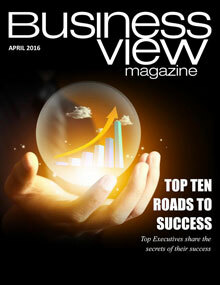 Finding that market sweet spot was the key to the company’s success. Light weight lifts were becoming increasingly popular, as well as necessary, in new office buildings that are constructed with access floors that route power, wiring, and ductwork below the work space, as opposed to above it. The access floor panels that cover the wiring, etc. cannot support heavier equipment; they require aerial work platforms that are light enough to travel across them. And Hy-Brid lifts filled the bill. Today, Custom Equipment, Inc. has grown from a small family business with a few employees to a globally-recognized, aerial equipment manufacturer. Hy-Brid lifts are fabricated and assembled in two facilities in Richfield, Wisconsin, northwest of Milwaukee. The company has 120 dealers in the United States, some of which have hundreds of stores, and many international distributors of its products. Jeffrey Valind is Vice President of Manufacturing and Operations. He says that the company reaches out to prospective dealers via trade shows, email blasts, trade magazines, and social media. There are also many feet on the street. “One of the biggest ways to get our name out there is demonstrations done by our salesmen,” he says. “We’ll do the research, find the dealers, contact them, and give them a demo of our product. Seeing the product is where they get a feel for the features.” He adds that the company’s immediate goals are to have a larger share of the light weight, low-level access market and a wider product line within the 19-foot, and below, range. With its continued success, Hy-Brid Lifts may ultimately defy those pesky laws of physics, and prove that – at least in the realm of business – what goes up doesn’t necessarily ever have to come back down. 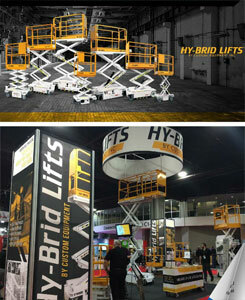 WHO: Hy-Brid Lifts by Custom Equipment, Inc.